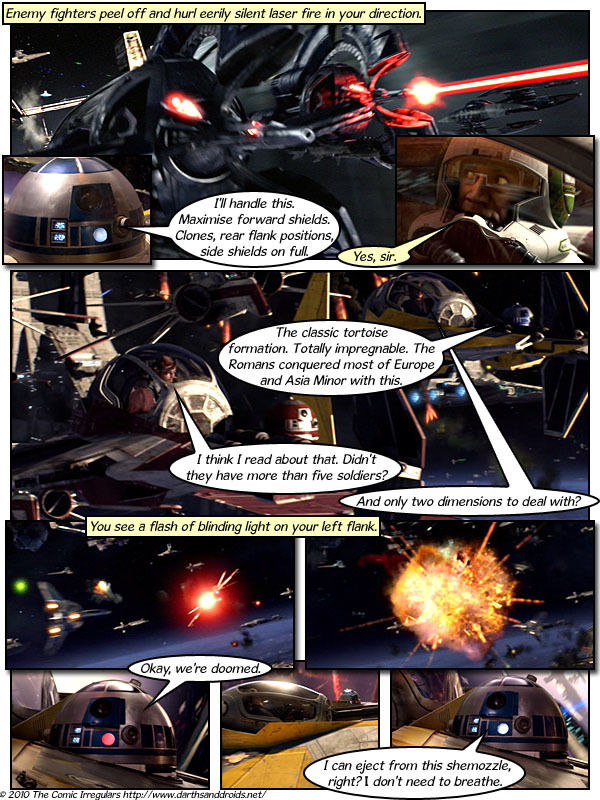 Darths & Droids is an “RPG screencap comic”. RPG – The characters in our comic are roleplaying game (RPG) players. The Game-Master (GM) guides the players as they take the roles of characters on a quest in a science-fiction universe. Screencap – Our visuals come from screencaps (still frames) of Star Wars movies. Any roleplayer wanting to maximise their chances in strategic-level battle encounters will of course study the classic masters. The Roman Army. The Strategicon of Maurice. Sun Tzu’s The Art of War. If only those armies of antiquity had had to deal with hordes of orcs led by magic-wielding evil high priests, or three-dimensional battles in space, it might even be of some use against the canny GM. Working its way through the Star Wars trilogy – this RPG Screencap comic is good fun to read and easy to catch up on. The commentary (in italics) only adds to the experience! The layout is easy to read and the script is tight and in with the theme.